customization and thus support well-informed decisions. With its 20.5 x 20.5 cm (8.1 in) square flat-panel digital detectors for EP procedures, Innova IGS 620 offers 38% greater coverage than 17.7 cm (7 in) square panels. It covers more anatomy, designed for fewer runs than smaller detectors, enabling efficient use of contrast and dose. Off-isocenter imaging allows you to see the vessels from two different centering positions with one injection in one fluoroscopic shot. For example, to verify the catheter position, you can simply move the lateral plane off-isocenter without changing or losing your frontal/AP plane position. You can visualize both the origin of the vessel (lateral) and the distal area (frontal/AP) with just one injection and one acquisition. Cardiac ablation is an invasive procedure performed to correct heart arrhythmias such as atrial fibrillation. Ablation typically uses catheters - long, flexible tubes inserted through a vein in the groin and advanced to the heart to correct or scar the abnormal electrical circuits that are causing the arrhythmia. Ultimately, ablation prevents abnormal electrical signals from traveling through the heart and restores normal heart rhythm. Plan your procedure with Innova Spin, which provides a dynamic fluoroscopic image of the atrium filled with contrast to help localize the abnormal tissue that is causing the arrhythmia. 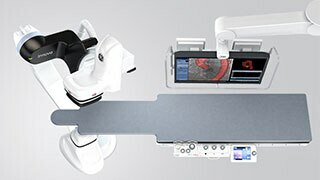 Guide your procedure with HeartVision*, an advanced visualization application that fuses a pre-acquired 3D image from CT, MR or rotational angiography over a live fluoroscopic image. Points may be tagged on the image to help provide reference to structures and ablation points throughout the procedure. Assess the success of the procedure using Cardiolab* - it allows you to review ECG and intra-cardiac signals after the ablation procedure to ensure clinical success. Guide with confidence your trans-septaI puncture and device deployment with pre-op CT overlay. Ultrasound imaging5 can be integrated to our Large display monitor6. All information coverage in one place to help you make fast decision. 4 – Valve ASSIST 2 solution includes TAVI Analysis, HeartVision 2 and requires Volume Viewer, Volume Viewer International. These applications are sold separately. 6 – The U/S Image on the Large Display Monitor is for information. The primary display for U/S imaging is on the Ultrasound screen.